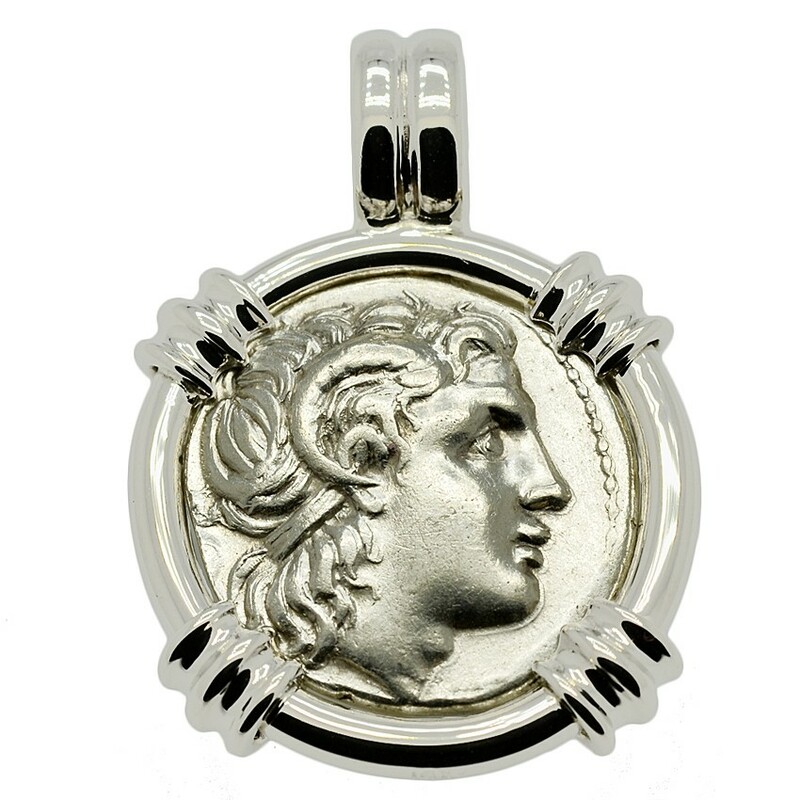 SOLD Alexander the Great & Athena Drachm Pendant; Please Explore Our Greek Pendants For Similar Items. This coin was minted during the rule of Lysimachos, about 25 years after the death of Alexander the Great in 323 BC. A former bodyguard to Alexander, Lysimachos rose to great power (323–281 BC) and controlled a large territory in Thrace and Asia Minor. 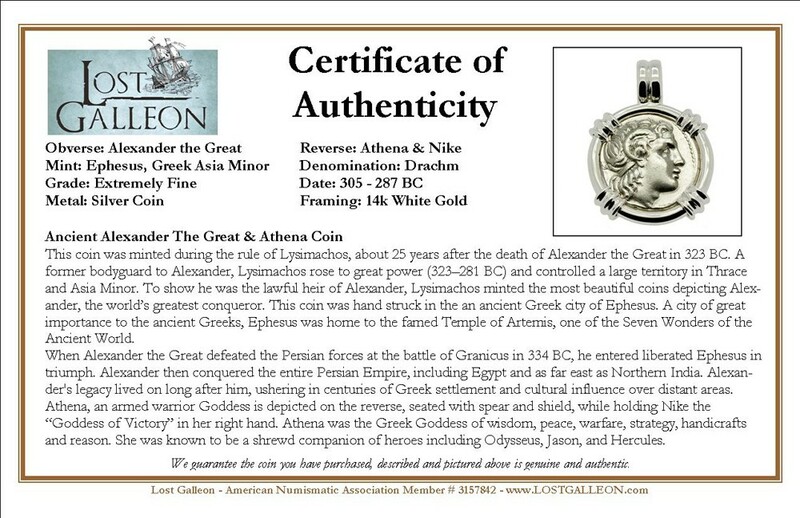 To show he was the lawful heir of Alexander, Lysimachos minted the most beautiful coins depicting Alexander, the world’s greatest conqueror. This coin was hand struck in the an ancient Greek city of Ephesus. A city of great importance to the ancient Greeks, Ephesus was home to the famed Temple of Artemis, one of the Seven Wonders of the Ancient World. When Alexander the Great defeated the Persian forces at the battle of Granicus in 334 BC, he entered liberated Ephesus in triumph. Alexander then conquered the entire Persian Empire, including Egypt and as far east as Northern India. Alexander's legacy lived on long after him, ushering in centuries of Greek settlement and cultural influence over distant areas. 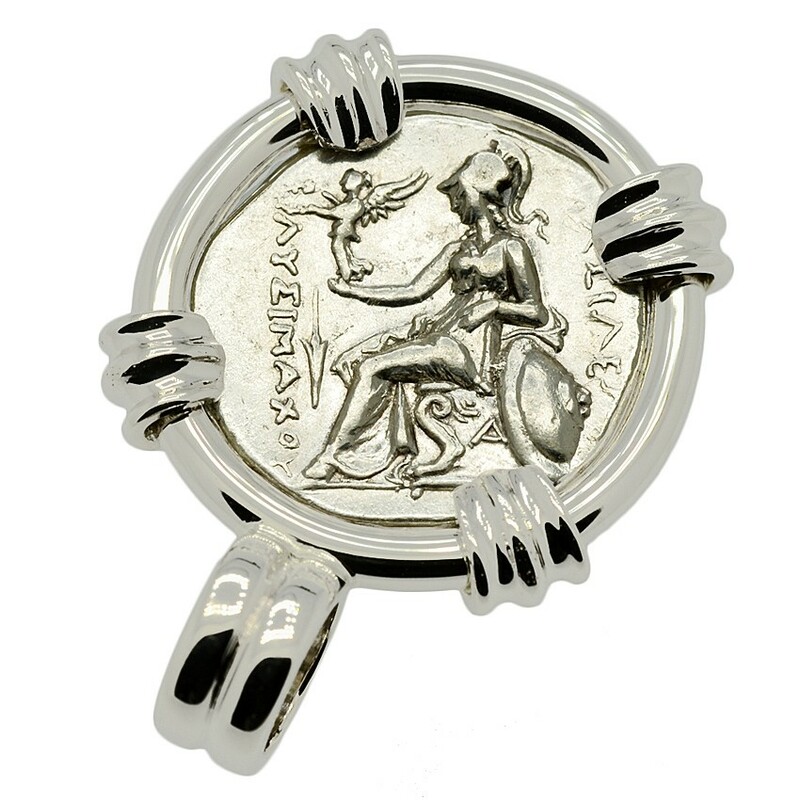 Athena, an armed warrior Goddess is depicted on the reverse, seated with spear and shield, while holding Nike the “Goddess of Victory” in her right hand. Athena was the Greek Goddess of wisdom, peace, warfare, strategy, handicrafts and reason. She was known to be a shrewd companion of heroes including Odysseus, Jason, and Hercules.